Android 8.0 introduces Notification Channels. Any application targeting the API Level 26 or higher is required to add support to notification channels, or its notifications will not be displayed. Fortunately, Batch comes with full builtin support for them: The SDK will register a default channel for your notifications, but many APIs are available to carefully configure it to send the right notification to the right channel. Note: You will need Batch 1.9.1, and support-v4 v26.0.0 if you target Android 8. Older versions will not display notifications properly. Once used, an application cannot change a channel's setting anymore, letting the user retain full control on them. This also means that these settings cannot be controller on a per-notification basis anymore, or from your own App's UI: Batch.Push.setNotificationsType() is affected by this, as any flag other than ALERT will be ignored on API 26+ devices. With Batch 1.9.1 or higher, the default behaviour is to register a channel named "Notifications", which ID is defined by BatchNotificationChannelsManager.DEFAULT_CHANNEL_ID. Or by providing an interceptor: Batch will call it before displaying any notification, giving you a chance to override (or not) the channel ID according to the content. These two ways to change the channel ID are not mutually exclusive: you can use both at once. Note: Batch will not try to register these channels. If you override the channel ID, it becomes your responsibility to manage it. If you register your own channels, but would like to keep Batch's default fallback, you can still rename the user-facing channel name. You can give Batch an implementation of the BatchNotificationChannelsManager.ChannelNameProvider interface, which will be called when Batch registers its channel with Android. Note: Like other global Batch configuration methods, these should be called in your Application's onCreate. Since this user-facing string is localized, your provider might be called on locale change. 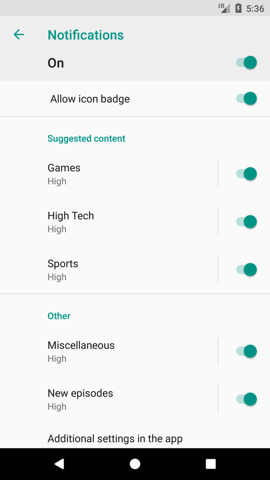 Since your app can't change any channels settings, you might want to show a button redirecting them to these settings, if you detect that they disabled the notifications. // Note: that will only work if Batch showed a notification once: the default channel is not registered beforehand. You should check if that channel has been registered beforehand. If you're using a custom implementation of the Notification Builder in your own receiver, you will have to register your own channel, and set it in your notifications.